The Islamic State threat seems to have been dealt with in Iraq – but does that mean the war-torn country will finally see peace? Mowaffak Al-Rubaie, Iraqi MP and former national security adviser to the government, shared his view. Sophie Shevardnadze:Dr Mowaffak Al-Rubaie welcome to the show, it’s really great to have you on our programme. Iraqi PM Al-Abadi declared victory over Islamic State in December. But the UN says violent extremism can re-emerge. The focus of an analysis was on Islamic State’s former strongholds in northern Iraq, which require urgent stabilization. You’re a member of the Iraqi parliament - what is the situation? Is it all over, all rosy, a brighter future? If so, why is the UN fear-mongering? Mowaffak Al-Rubaie: Well, it depends on how you define victory. If you mean a military victory, than yes, we have inflicted a huge defeat on ISIS in Iraq. It took us three years to drive them out of Iraq. But if victory is not only military, the security needs to be addressed in a more broader term. This is a counterterrorism intelligence-led war. We need to build-up our intelligence agencies, we need to build-up our human intelligence, our signal intelligence, our surveillance and so on and so forth. So we need to do that to really declare a security victory, not only a military victory. To be honest with you, the threat is not only military, security or economic. And the challenge is the ideological one. People are talking about political inclusion and so on and so forth. That’s an ideological challenge that needs to be addressed, and it will take probably decades, not years, to declare an ideological victory on militancy, terrorism and Wahhabism. SS: Because not only ideologically, but the Iraqi soldiers are fighting IS in provinces that have been declared liberated for a while. There are spots near the Syrian border that aren’t under Iraqi control at all... And IS claims to be behind regular bombs in Iraq. Is it too early to say ISIS has been defeated militarily? MR: They may well resurge if there’s an intelligence gap and a security breach in the right time, if there’s a military setback in the country, or if sectarian and political polarisation comes back, then it will provide the right circumstances, the right environment for ISIS to re-emerge again. SS: The Iraqi government's previous mistakes led to Sunnis turning to extremism many times before. Can we count on the Iraqi government to get it right this time with its Sunni citizens? MR: I don’t think honestly that you can blame the Iraqi government only. Probably some of the policies of the previous government and this government can be blamed. These policies and these strategies can be blamed. But I think, it’s always a simplification to blame one single factor. I’ve always been of the opinion that that’s a multifaceted story. SS: But, Dr Al-Rubaie, you’ve just said the sectarian violence is something that can actually make ISIS stronger again. That is what I mean. MR: ISIS is, as I said, not a security phenomenon. It’s not a military phenomenon only. It’s not only a group of people disenfranchised or disenchanted economically, but politically. You inject some cash in the local economy of this or that province and it will be sorted out. Or you do a political inclusion of some faction that feels marginalised, and it will be sorted out. No, ISIS is a global phenomenon. ISIS is an ideological challenge. This is Salafism, Wahhabism, whatever you call it. One of its manifestations is in Iraq, called ISIS. In Syria it’s called Al-Nusra. In Nigeria it’s called Boko Haram. In Pakistan and Afghanistan it’s called the Taliban or Al-Qaeda. In south Yemen, for example, it’s called something else. In Somalia it’s called Al-Shabaab. So this is a manifestation of an ideology behind it: it’s jihadism, it’s Wahhabism. These are physical manifestations of the same ideology. SS: I understand your point and I tend to agree with that. And since I’m talking to you we can’t talk for the whole world. So let’s talk about what’s going on in Iraq. Iraqi parliamentary committee is saying that ISIS smuggled hundreds of millions of dollars when it retreated from the country. Moreover, the terror group even invests directly into the Iraqi economy, laundering its money and taking cuts from legitimate business profits. What would you say about that? Why is the Iraqi government allowing this to happen? MR: .. with fighting corruption. SS: You’ve just hit it on the nose. I’m sure you know the politician Mishan al-Jabouri, he’s your colleague, Iraqi politician from the parliamentary anti-corruption committee. He says everyone in the government is corrupt - even admitting to taking bribes himself. How can the Iraqi government go after ISIS, after ISIS' finances if they can all be so easily bribed? MR: This is very unfortunate, ma’am. This is really depressing. I don’t agree with what the gentleman whose name you’ve mentioned, says that all the members of the Iraqi government are corrupt. This is totally untrue. I can tell you that there are so many members of parliament, so many government officials who are honest national Iraqi patriots and we are proud of them. SS: You’ve just said ‘several’ of them… But then that makes whole lot other politicians who can be easily bribed, right? MR: I can’t deny that corruption has been institutionalised, if you like, in the ministries. There are several ministers, members of parliament and government officials who are corrupt and corruption is horizontal as well as vertical in the government of Iraq. And the Prime Minister has to declare a real fight, a real war against corruption in Iraq. To fight corruption, ma’am, you need to have a strong political will. You need to have a strong, good and honest justice system. SS: But how is this going to happen? Troops and airstrikes can defeat an enemy, but corruption and inefficiency is what makes the enemy reappear - neither the Americans nor the Iranians can make sure Iraq does a good job governing itself. Is the country doomed to see another uprising in the future with such an inefficient government, or is a miracle going to happen? I mean, when you say that the Prime Minister has to be strong,officials start doing their jobs and stop stealing money - what has to happen for that? MR: I think, there are things you need to provide to fight corruption. First, it’s the strong political will. Second, it’s the strong leader on top of the government. Third, you need a very strong, good and honest legal system and, also, an executive system: police and army. Unfortunately, the corruption is widespread. This needs to be tackled and the government has to do a lot of work for this. To fight it we need an investigative system. We probably need help from the outside world as well. Because a lot of our ministries are politicised and indoctrinated. A lot of our institutions have been politicised and belong to this party or another. So we need a professional government, professional ministers, professional government officials who are honest and strong people. This is a golden opportunity for the general election in May this year. This is a very good opportunity for our people to choose the right, honest and strong members of parliament to produce a strong government to fight corruption. SS: There are about 5,500 U.S. train-and-assist troops in Iraq currently. Now that ISIS is no more as a serious military force, should they stay or should they go? Are Iraqi forces fully capable of maintaining security by themselves? MR: See, we only needed American military help in air force in the last four years. We honestly don’t need any ground force from any country in the world including the United States of America. What we need is trainers and not a fighting force. The number of American troops in the country now is under 10 thousand by their own admission. I don’t think we need more than a few hundreds to help us in training. I believe, they are ready to go back home. We don’t need them. We said this right from day one. SS: I remember you saying back in 2014 very forcefully that there should be no foreign boots on the ground in Iraq during this war. Now there’s obviously foreign boots on the ground in Iraq whether you want it or not - the Americans, the Iranians, the Turks. So is it ok for you to see foreign boots on the ground at this point? If not, then should they be asked to leave? How does it work? MR: I have to differ with you, ma’am. I said on day one four years ago that we wouldn’t need any fighting force on the ground because we wanted to have the credit and honour to liberate our own territory with our own forces. Going back to your question, there’s no Iranian military force on Iraqi soil. This is number one. Number two is that the Turks have been illegally present up north in one of the military camps. We have told them that this is an encroachment of the Iraqi sovereignty and Iraqi independence. And I think, they should leave as soon as possible. We don’t need them. We have never used them, we have never needed them, we’ve never asked them to come to the country. On the contrary, we asked the Iranians so send us some advisories. They sent us some advisors and trainers, we’ve used them and they will go back home. We are talking about hundreds. There are less than a hundred advisors and military trainers in Iraq. But compared to several thousands of Americans this is a completely different kettle of fish, ma’am. SS: Ok, let’s say, Iran helped save Baghdad from ISIS takeover, and then helped the Iraqis take Mosul, sent advisors, like you’ve said, they certainly sent materials. Now that the fight against ISIS is in its final hour, are the Iranians just going to go home? What kind of gratitude can they expect? They surely didn’t just help you out of good will and will ask nothing in return. It doesn’t work this way. SS: But my question was about a different thing: what do you think the Iranians will ask Iraq in return for their help? They certainly did not just helped you because they are nice and kind people. They would want something in return as a favour. MR: Most of the materials that they provided (weapons and munitions) - they have billed us for it. They sent their invoices and Iraq paid some of them and is in the process of paying the rest. So they are not free of charge. They are not freebies, if you like. I don’t think, training and advice will cost us money. Of course, if you are referring to the political influence of Iran in Iraq, there are so many friends of Iran in Iraq among the Shias, the Sunnis and the Kurds. And Iran is the first country which recognised the new Iraq after 2003. Iran has always supported the political process, the constitution and the sovereignty of Iraq. We have a very intimate relationship with Iran. Our relationship with Iran is not only strategic, but symbiotic, if you like. Each country is dependent on the other. SS: Let me ask you a more geopolitical question - Iraq which, like you’ve said, has a very special relationship with Iran, almost symbiotic, also has a very special relationship with the U.S. Those two countries as of today are at odds and we don’t even know what’s going to happen with Trump being president. How will Baghdad balance it out, ensure it receives help from both? SS: Exactly, the U.S. military presence gives Washington leverage over Iraqi decisions. How do you stay fully independent when you rely on foreign powers for your security? That’s a very tricky situation. MR: I certainly agree with you. The only way forward is to build a strong, united, independent, sovereign country to deter neighbours from any interference in our internal affairs and not depend on the international superpowers. That is the way forward: to have Iraqi national, strong government, to have a united, independent and sovereign country built by our own people. MR: I totally disagree with that. Terrorism was all over the world well before the overthrow of Saddam Hussein. That’s why I say that the eruption of terrorism in Syria and Iraq was helped by some of our neighbours because they wanted to bring down the Syrian regime and the new democracy in Iraq, it threatened their own governments. See, democracy is a catching disease, if you like. It crosses the borders without permission, without a visa. That’s why they were frightened by the democracy in Iraq, it’s freedom of speech and freedom of thought, and the new parliamentary constitutional system in Iraq. That’s why they plotted against Iraq and helped ISIS with money, logistics, men and ideology on both sides of the Syrian-Iraqi border. That’s why ISIS emerged in Syria first and came to Iraq then literally simultaneously timewise. SS: Alright, Dr Al-Rubaie, thank you very much for being with us on this programme and for giving your point of view. MR: Thank you for having me. 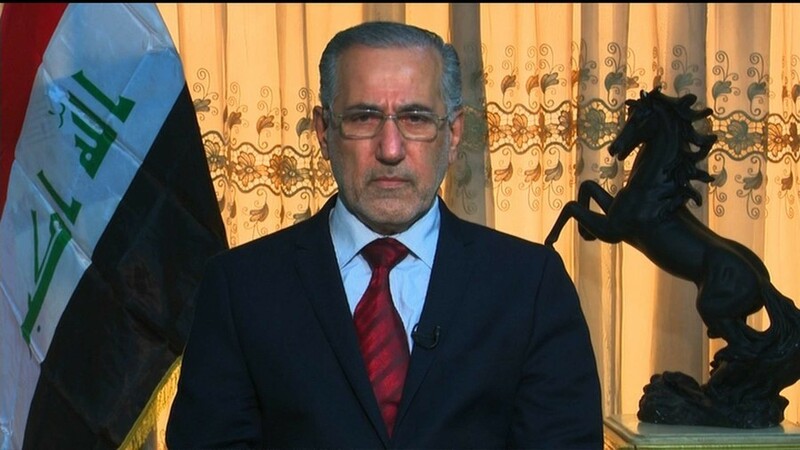 SS: We were talking to Dr Mowaffak al-Rubaie, Iraq's MP and the former National Security Advisor, discussing Iraq's efforts not to slide back into bloodshed after extremists are driven out. That's it for the this edition of SophieCo. I'll see you next time.